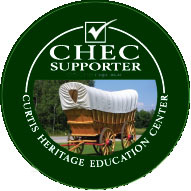 It’s all about history -- preserving history is the key to our future. History is a thread that draws us together. By preserving our history, we can learn from past mistakes and go forward with a new awareness. Our experiences serve to enlighten us and to help us become survivors. Our goal is to document and create a historical record of times past by sharing something inanimate with you and bringing it to life. History can tell us a story if we let the images speak. You will see a glimpse into life in the early days of Portland, and its surrounding communities. Grab your mouse and let your fingers do the clicking as we journey into the past. You will see and experience a slice of life from early in the 20th Century. Unfortunately, many of the icons that shaped our lives so much are only a fading memory. Postcards as we know them, were first published about 1901. Prior to that time, there were smaller trade cards as well as postal cards which usually carried advertising or printed messages. Trade cards became popular with the enterprising merchants who distributed them from the 1870s to the 1890s. With the advent of the camera, which was developed in the mid-1800s, stereo-optic views followed in the 1880s and later the post card in 1893, history would be forever immortalized in print. Artist’s conception of Portland’s Council Crest the Amusement Park on a Mountaintop. The new art of photography spawned the inexpensive post cards and, even earlier, stereo-optic view cards, which enabled many people to see a glimpse of the places where friends and family members lived, worked and visited across the world. Postcards became a standard-sized medium for communication, advertising and promotion. Having been mass-produced in Germany using highly advanced methods of lithography, post cards became very popular at Coney Island in New York, where over 200,000 post cards were postmarked on a single day in 1906. Post cards became the calling card for cities, towns, businesses and roadside attractions. Souvenir shops sprang up all over the country to sell post cards that extolled the virtues of their corner of the world. Nearly all of the lithographed post cards were made from a photograph. Through the process of color separation, the enlarged photographic image is converted into many thousands of tiny dots with the use of filters. The dots are used to shade in the varying colors of ink as they are printed. 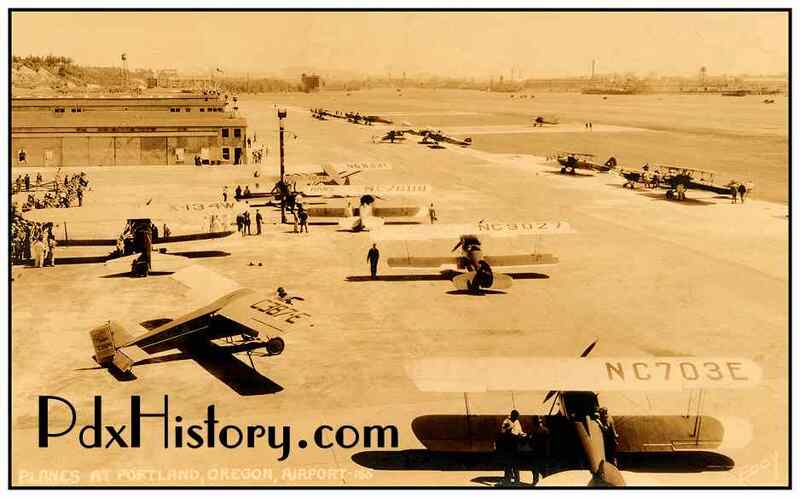 You can explore some of my favorite post cards, Amusement Parks, Trains and Department Stores. You can take a tour of North American Train Depots and Ripley Odditoriums. You can also view a glimpse of historic Seattle. If you like a good scary story, don’t miss the Haunted Light by the Sea. You can also visit New York’s Rockefeller Center, Subways and Amusement Parks. Portland lies at the foot of Mt. Hood and at the confluence of the beautiful Columbia and Willamette Rivers. Some of the most beautiful views in the world are found 20 miles to the east of Portland along the Columbia River. Lewis & Clark scouted and mapped the Oregon Country after leaving St. Louis in 1804. They spent a couple winters in the Pacific Northwest and they returned to Washington D.C. in 1806 to extol the virtues of the New World. Great interest developed after their glowing reports of the mild climate, the lush green forests and the fertile farming land as well as the abundance of pure rivers lakes and streams. In 1843, Tennessee drifter William Overton and his friend, Boston lawyer Asa Lovejoy were floating down the Willamette River in a canoe when they came upon the beauty of the place we now call Portland. They beached their canoe and they marveled at the beautiful mountains and the rich potential of the many trees they saw. Overton didn’t have the quarter that was required to file a land claim, so he sold half of his 640-acre share to Lovejoy for 25 cents. They began to clear the many trees, build roads and build the first buildings. After a while, Overton decided to move on and sold his half of the share to Francis Pettygrove. 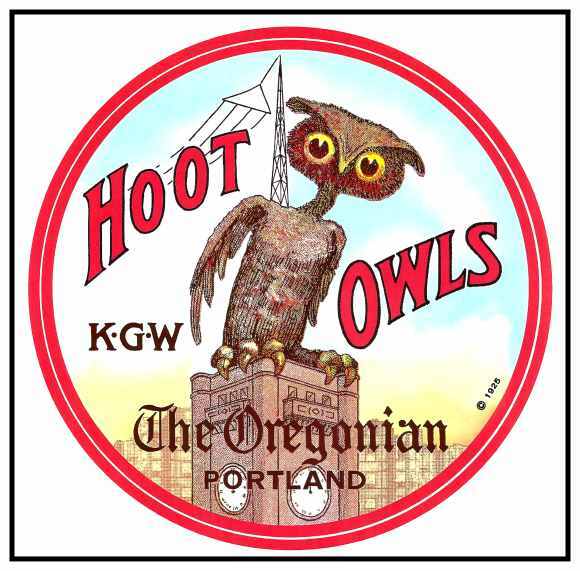 Portland got its name when Asa Lovejoy and Francis Pettygrove flipped a coin in 1845. Lovejoy was from Massachusetts and he wanted to name the new settlement Boston. Pettygrove was from Maine and wanted to name the new town Portland. Pettygrove won the coin toss two out of three times and the rest as they say is history. Portland’s first Post Office opened in 1849, and the steam sawmill’s whistle could be heard as far away as Fort Vancouver. By 1850, about 800 residents called Portland home. There was a log-cabin hotel and a newspaper, the Weekly Oregonian. Congress passed the Oregon Land Act, which entitled every man or woman to 320 acres. Portland was incorporated in 1851 and it has grown into the second largest city in the Northwest. People who settled in the region made their living catching and selling fish, cutting timber and producing lumber, growing and harvesting wheat and raising cattle for market. Portland became a major transportation center because of its proximity to Railroads and Rivers. 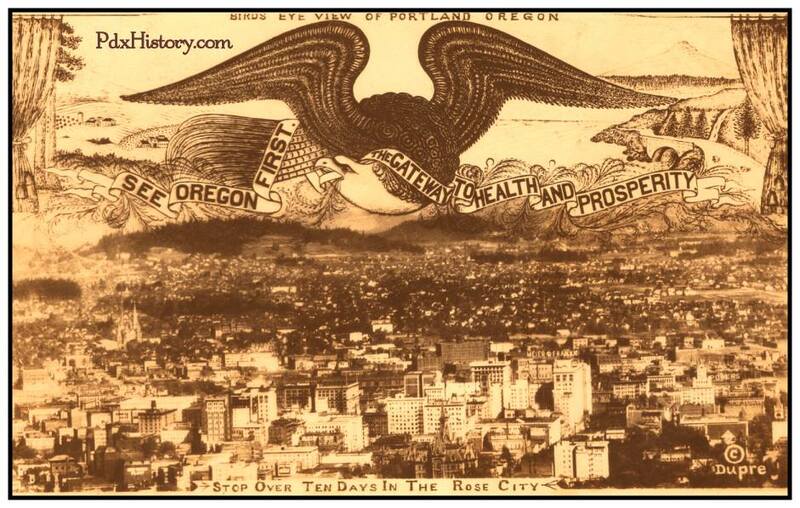 Oregon became the 33rd state to join the Union in 1859. Prior to that time, it was known as the Oregon Territory and it stretched from California to Canada along the Pacific Coast. The Oregon Territory stretched east to the Rocky Mountains from the Pacific Ocean. The Territory encompassed what are now the states of Washington, Idaho and Montana. 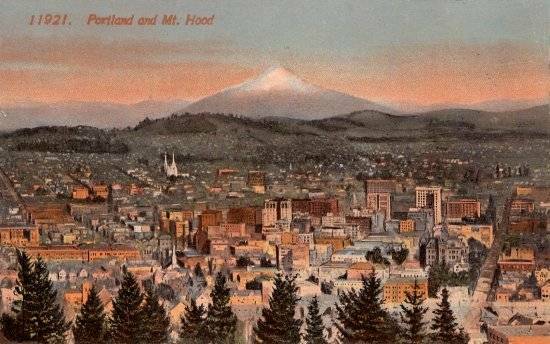 Portland began to grow fairly rapidly after the Civil War, building docks for shipping lumber, fish, wheat and produce to San Francisco and the rest of the world. Farmers were demanding better roads to haul their goods to Portland for shipment. Railroad history in Oregon began when Ben Holladay started building the Oregon & California Railroad in 1869. After Holladay ran short of funds in 1872, Henry Villard took control of the project and got as far as Ashland. In 1887, the line was finally opened to California, after Southern Pacific took over construction. Union Depot, shown above, was built in 1893 and 1894 to house Henry Villard’s Northern Pacific Terminal Company. It served as a station for all of Portland’s incoming and outgoing trains. In its heyday, a total of 92 trains called on Portland daily. 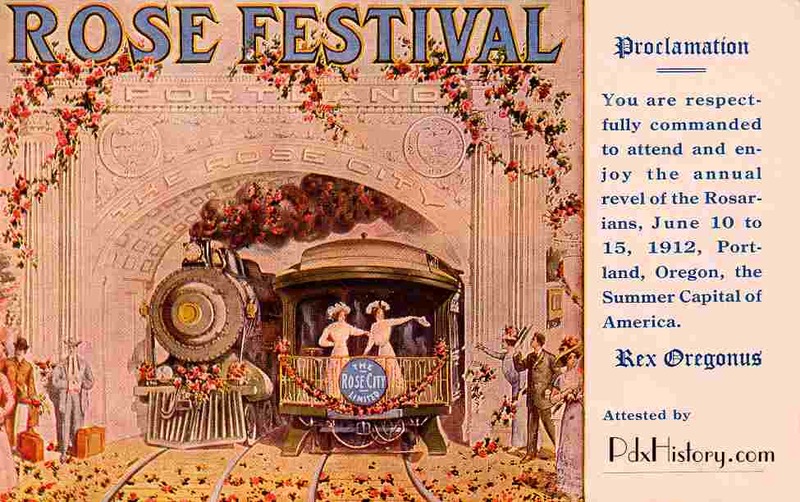 Portland’s Lewis & Clark Exposition and World’s Fair attracted 3 million visitors in 1905. 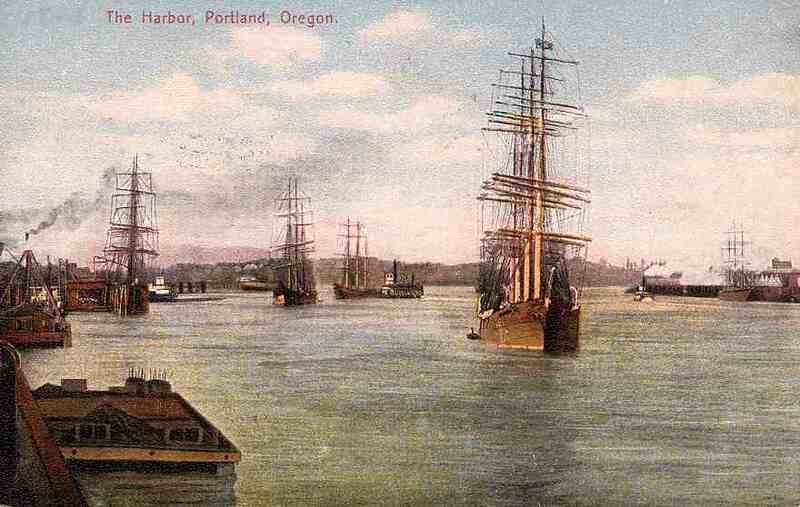 By the end of the 19th Century, Portland had 90,000 residents and it was the largest metropolis in the Northwest. Portland had the busiest port up the coast from San Francisco. The Alaska Gold Rush and the Railroads began to make Seattle boom. 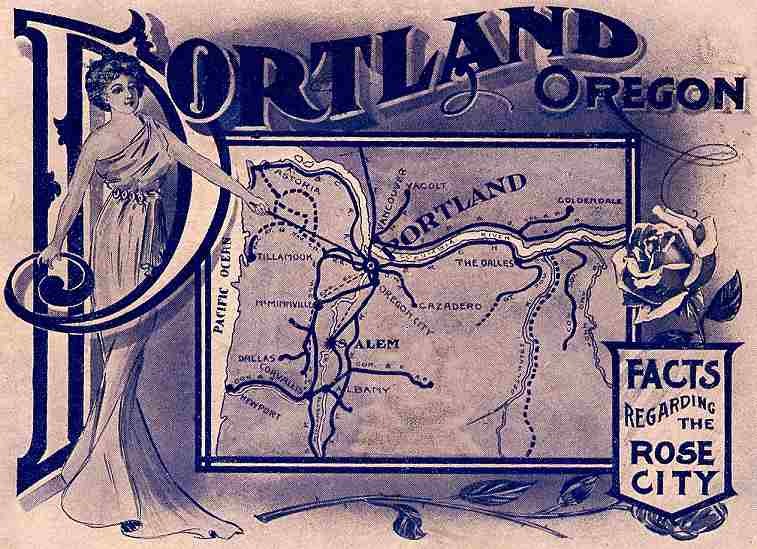 Portland’s leaders took a bold step to promote growth by holding a World’s Fair in Portland in 1905. 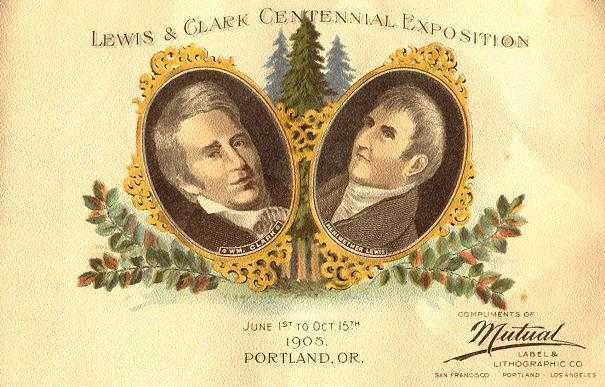 The Lewis & Clark Exposition took up residence along the Willamette River waterfront in northwest Portland. Coney Island’s Dreamland was barely open a year when Portland’s leaders summoned some of the cutting edge amusements of the day to come west to Portland. Luna Park had only been open about two years; Steeplechase Park had been open seven years and it was attracting the masses. Three million people came to Portland’s Party and many of them decided to stay. Portland’s population doubled in the next five years. Portland Railway Company Car at the end of the line on 16th Street in what is now Northwest Portland. The resourceful Ben Holladay’s horsecars began plying the rails in Portland on September 12, 1871. In 1892, Portland began electrifying its streetcar system. By 1905, there were 150 streetcars per hour shuffling passengers to the Lewis & Clark Exposition. Portland’s Council Crest line was the most scenic and spectacular streetcar line in the Northwest. Once upon a time, Portland boasted one of the most efficient streetcar systems on the West Coast and the third largest system in the world. Very little remains of Portland’s extensive streetcar system. 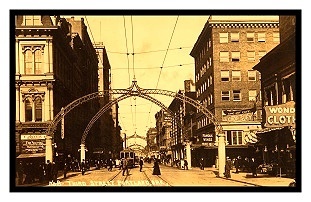 Portland’s unique four-corner arched lamp posts lined Third Street until the 1930’s. 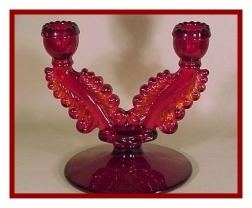 In the 1890s and early 1900s, electricity was a new phenomenon. It was the key to many “modern conveniences”. Electricity provided the energy to transport the masses and light our world. It changed life as we know it. Several power plants were built to generate the power that was used to electrify the streetcar lines and to light Portland’s streets. It also ushered in a new era that brought us air conditioning, hot and cold running water, toasters, stoves, refrigerators, hair dryers, radios and everything we couldn’t live without today. 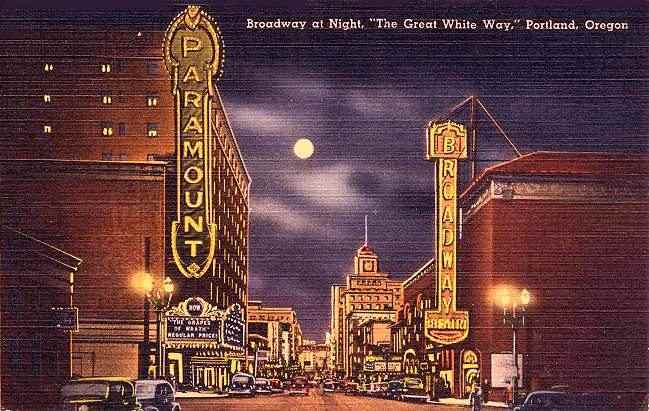 Broadway anchored Portland’s Theatre District. The silent version of The Road to Ruin was released in 1928. Rose Festival time comes in late Spring as the roses begin to bloom. Portlanders pause in their everyday pursuits to celebrate a mythical Kingdom that is ruled by the Queen of Rosaria and her Court who each represent one of Portland’s High Schools. 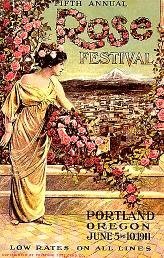 The Rose Festival spans over a month, mostly during June and it includes several parades (including the second largest floral parade in the nation, the Grand Floral Parade; an all-Children’s Parade and the night-time Starlight Parade), as well as numerous other events. 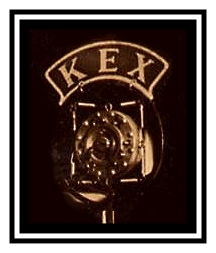 Portland Radio Historian Craig Adams has written a history of Rose Festival Broadcasts. Royal Bakery wagons lined up as they began their daily deliveries. Some of Portland’s more memorable restaurants and confectioneries included the Hazelwood Cream Store, Royal Bakery & Confectionery and Simmons Hillvilla. Portland had several drive-in eateries. There was Waddles and Yaw’s Top Notch to name a couple. Portland’s Jantzen Beach Amusement Park was known far and wide for the huge Dipper, the biggest coaster in the West. 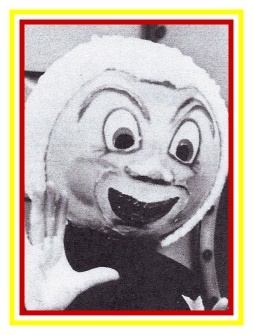 Portland had several prominent Amusement Parks. The only one that survives today is Oaks Park, which was Portland’s first, opening in 1905. Council Crest Amusement Park opened in 1907; Columbia Beach opened in 1916. Blue Lake Park opened in 1925; Portland’s most famous park, Jantzen Beach, opened in 1928 and the mysterious Lotus Isle opened in 1930. 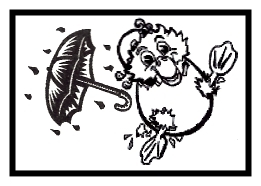 Follow the adventures of Al Painter’s Lotus Isle Walkathon. Portland was home for a number of department stores over the years. But sadly, they only exist in memory. There was Lipman & Wolfe Company and Olds, Wortman & King, as well as Roberts Brothers, Holtz, and Eastern Outfitting Company to name a few. When Macy’s acquired Meier & Frank in 2006, Portland lost its largest and most wonderful department store ever to claim Portland as its home. After 149 years, Meier & Frank closed and a grand legacy of Northwest Style and Tradition faded into history. Another grand department store, Chicago’s Marshall Field’s and nearly 30 other regional department stores ceased to exist on that fateful day in September 2006. Macy’s has become a nationwide powerhouse with over 700 stores from coast-to-coast. Seattle was home to two very powerful department stores through the years that lost their ability to attract the City’s shoppers and have faded into memory: Frederick & Nelson, which became a Premier Division of Marshall Field’s in 1928 and closed in 1992 after 100 years with two decades of local ownership which failed to keep the Northwest’s Premier Store alive; and The Bon Marche’ became Macy’s Northwest in 2005. Portland’s roots can be traced to its neighborhoods and surrounding communities. As each settlement or town was established, a Post Office would be built there and cancellation stamps were issued to identify the sending post office. For a few years, around the beginning of the 20th century, the sending and the receiving post offices would each stamp a cancellation or postmark on every piece of mail. Most of these towns grew up along the streetcar and rail lines. Towns such as Bull Run and Estacada were built so the workers who built and maintained the power generating facilities could live near the dams and power houses. Sellwood had a large blue-collar district; it was home to several mills and manufacturing plants as well as the Sellwood Car Barn where Portland’s Interurban Streetcars were housed and maintained. The town of Multnomah in Portland’s Southwest Hills got its name from the Oregon Electric’s Multnomah Station which was built in 1907 at what is now 35th and Multnomah Boulevard. A post office opened in Multnomah in 1912. Other surrounding towns and neighborhoods in the Southwest Hills included Burlingame, Capitol Hill, Fulton Park and Hillsdale. Further to the west, in the spring of 1847, the first land claim (comprising 640 acres of Beaverdam) located in what is now Beaverton was taken up by Lawrence Hall. Oliver P. Lent of Ohio arrived with his wife in 1852 and they settled at a small community east of Portland called Sycamore. In 1866, they moved a little to the west to a tract of 190 acres which is the current site of the community of Lents, Oregon. A post office was established at Lents in 1886 and it operated until 1917. Oliver Lent built and operated a sawmill for many years. He served as school director, road supervisor and justice of the peace. Portland’s Hollywood district started taking shape along Sandy Road around 1900. It was originally called Hollyrood. In 1926, after the Hollywood Theatre opened, the area was renamed Hollywood. Agricultural enterprises were plentiful in Gresham. 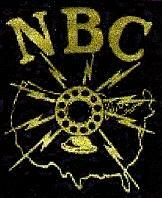 There were many berry growers, fruit and vegetable truck gardeners, nut farmers and nurserymen. 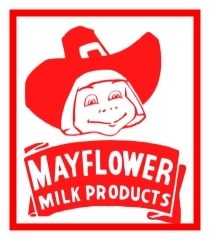 There were dairymen and cattle ranchers as well. They utilized the streetcars and later freight trains to ship their goods and bring them their fertilizer, feed and supplies. There were many manufacturing plants and mills in St. Johns. There was easy access for marine traffic and exceptional railroad facilities. The Portland Woolen Mills had originally been located at Sellwood, but after a disastrous fire in February 1904, they moved to St. Johns and built a new plant. Early view of the newly opened Hotel Kenton as sidewalks were being constructed in 1908. Kenton’s Rail Yards helped to make the town an industrial area. It became even more famous as Cowtown when Swift Packing Company set up shop opposite Hayden Island on the Columbia Slough in 1909. Swift employed over 600 workers and they butchered more beef in Kenton than in any other town in the Northwest. When the cattlemen brought their herd to market, they lived it up in Kenton. As Portland grew and expanded, it annexed many of the smaller towns into the city limits. 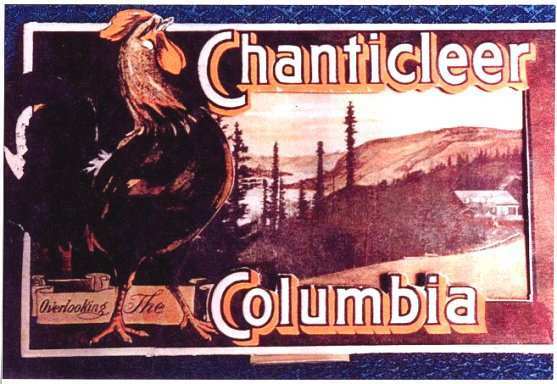 Opening in 1912, The Chanticleer Inn, was located about 25 miles east of Portland, above the Columbia River. It was known for its extra-ordinary chicken dinners and magnificent views. When the unpaved Columbia River Highway opened in 1915, it provided a way to drive to to the popular Chanticleer Inn. Prior to that time, you had to ride a steamer or catch a train and endure a steep climb up trails through the forest on the cliffs above the Columbia River. Other roadhouses were built along the highway and they served up the best food. A drive out the highway would not be complete without a fine dinner at one of the large and popular inns. The roadhouses gave the weary travelers a place to get refreshed and they offered up breath-taking views of the Columbia River Gorge. 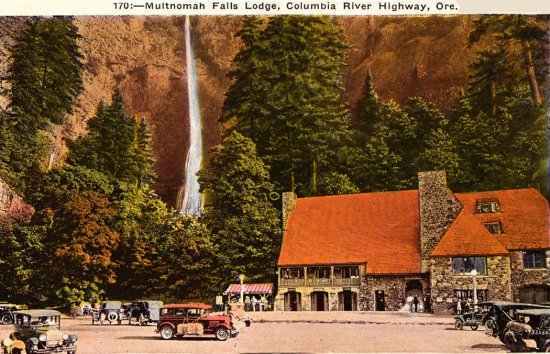 The rich and famous people of the day, from Hollywood to the East Coast, drove 25 miles east of Portland to the Chanticleer Inn, The Crown Point Chalet, Forest Hall Multnomah Falls Lodge. Not wanting their patrons to crash after enjoying a fine meal, most of the roadhouses refused to serve alcoholic beverages. Oregon is fortunate to have a number of natural scenic wonders. One of the most popular stops along the way is Multnomah Falls along the Columbia River Highway. Legend has it that an Indian maiden leaped to her death from the Upper Falls after a medicine man told her that her sacrifice would save her tribe from a fatal epidemic. It is said that her spirit still protects visitors there today. There are people who say they can see her face in the rocks and cliffs. Early pioneers who saw Mt. Hood for the first time marveled at its captivating beauty and they were drawn to the perpetually snow-covered mountaintop. Mt. Hood is perhaps the most popular mountain in the Western Hemisphere. It is the second most climbed mountain in the world after Japan’s holy peak, Mt. Fujiama. Legend has it that if the mountaintop is covered with a cloud or hood, it will rain. If there is a ring of clouds around the collar, it will be fair weather. Oregon lays claim to the most beautiful ocean coastline in the world. Poke around old Seaside and explore historic Newport and Nye Beach as well as Gearhart By The Sea. Go hunting for Bayocean, the Amusement Resort that fell into the sea. Discover the rich history of Astoria and Long Beach, Washington. 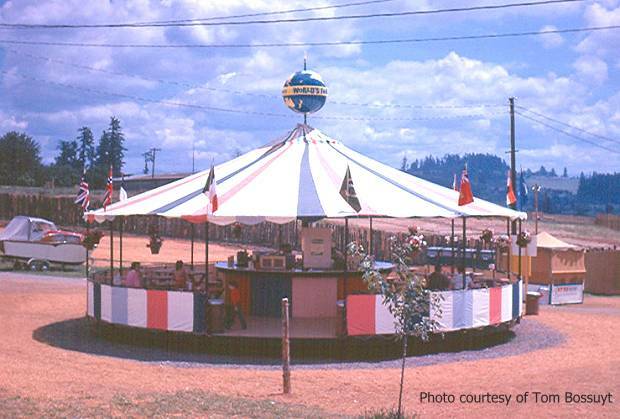 Visit the not so distant past of Oregon’s modern theme park, Pixieland. Throngs of people watch from the rooftop of the new Portland-Columbia Airport as a plane takes off in 1940. Unfortunately many of the icons we have tried to share with you no longer exist or they are a mere shadow of what they once were. Our leaders rarely have had the foresight to fight to save the things that shaped our past and impacted our lives so much. Many of these icons are left to exist only in memory. To venture forward, visit our site map.